In summer, we raise tomatoes, eggplants, cucumbers and so forth, and mainly green vegetables in winter. We are also working on producing a kind of ancient rice species, known as purple-black rice. We also raise trees and vines of many varieties, including chestnuts, grapes, apples, plums, persimmons, peaches and kiwi fruits. Of course, we harvest and use the fruits. Our agricultural fields have peacocks and rabbits, among other animals. We also keep bees. Our honey products are really popular at our school festival. We have a tract of green land set aside for cultivating garden flower seedlings, indoor plants, and chrysanthemums, among other plants. 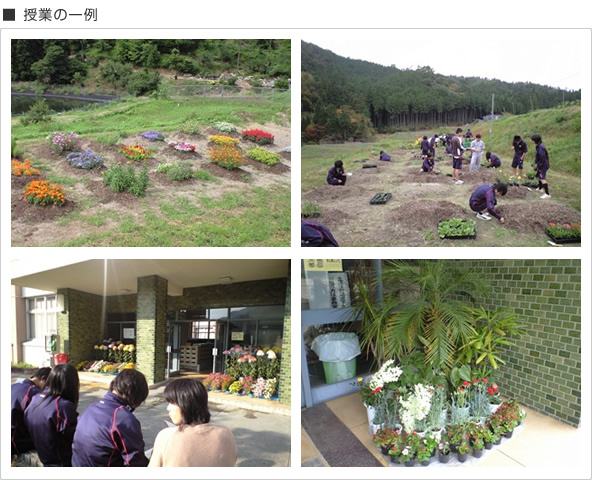 Students can learn flower decoration hands-on, and show the results by displaying their creations in front of our school buildings. 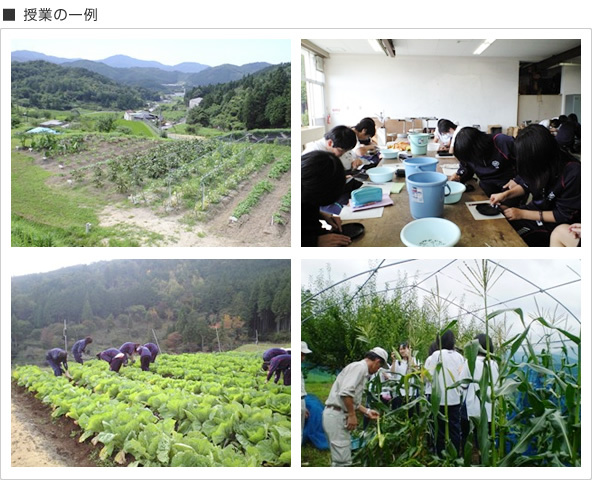 In the first years’ “Basic Environmental Science” class, students investigate insects and plants in our spacious agricultural fields, as well as learning basic agricultural skills. 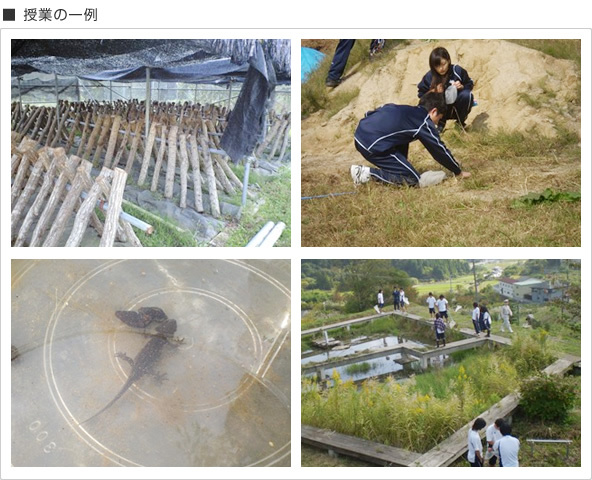 There is a large specially designed “biotope” pond where students can study aquatic creatures. In the second and third years, students use cell culture technology and work on conservation and multiplication of the Japanese lily, which is the official flower of Nose Town. They investigate the fire-bellied newt, which is listed on Red List of Threatened Species of Japan by the Ministry of Environment. 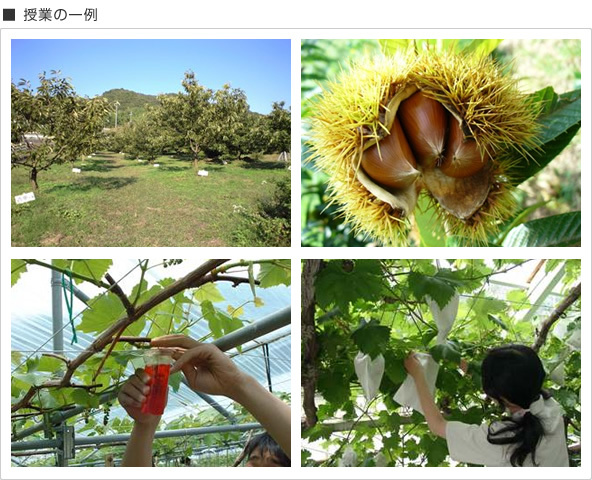 Moreover, lectures are given on the study and cultivation of mushrooms and bird watching while nature walking. At Nose High School’s agricultural fields, we take some time of our lecture time to share what we have been learning with local elementary school students. Our teachers work with teachers from the elementary school to organize lectures together, mainly focusing on the four basic topics that are taught at the Nose HS fields: fruit trees, animals, vegetables and flowers. Our students take the lead in teaching the elementary school students all sorts of things about raising animals and plants.